Painted Rocks left at memorial sites in Isla Vista. Photographed by Claire Bredenoord. Card and flowers received by Tri Delta Sorority (on loan). Photographed by Claire Bredenoord. Candles left at memorial sites in Isla Vista. Photograph by Claire Bredenoord. Origami cranes left at Capri Apartments memorial site. Photograph by Claire Bredenoord. 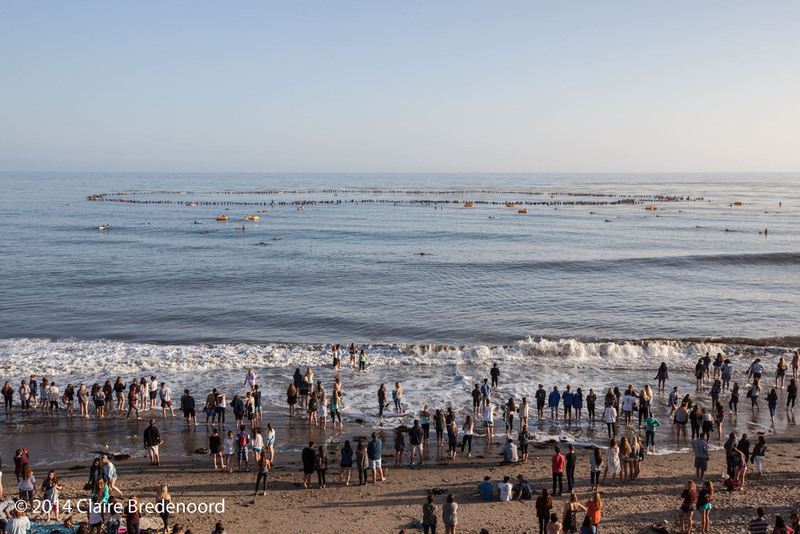 Memorial Paddle Out, Isla Vista. Photograph by Claire Bredenoord. Taking flowers out to sea for Memorial Paddle Out. Photograph by Claire Bredenoord. Memorial Paddle Out. Photograph by Claire Bredenoord.